The Title "Sacred Origins of Profound Things The Stories Behind the Rites and Rituals of the World's Religions" is written by Charles Panati. This book was published in the year 1996. The ISBN number 0140195335|9780140195330 is assigned to the Paperback version of this title. This book has total of pp. 608 (Pages). The publisher of this title is Penguin (Non Classics). 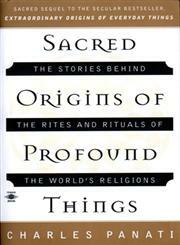 Sacred Origins of Profound Things The Stories Behind the Rites and Rituals of the World's Religions is currently Available with us.